Although Jean Dewar spent well over 50 years living in Africa, she never lost her Scottish roots, which is why, when she died in 2013 at the age of 83, her two sons chose a very special cremated remains casket to mark her passing. They turned to Colourful Coffins for help in designing the casket, which was interred in a cemetery in Dunfermline, Fife, where their father’s casket had been buried several years previously. “Although they both were born and bred in Scotland, my parents went out to Africa to work in the 1950s and my brother and I grew up there,” said younger son Craig. “We had a wonderful life in what is now Zambia and Zimbabwe, and Mum only returned to the UK to live near us after my father died in 1999. 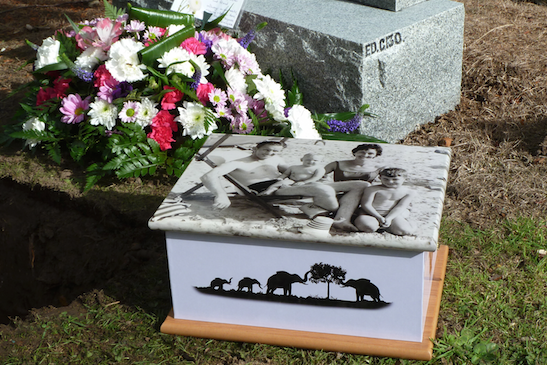 Craig and his brother Maurice chose a favourite photograph, depicting the family in their younger days on a beach holiday in Durban to illustrate the top of the casket, while either side featured a group of four silhouetted elephants and either end had a trio of thistles. “Colourful Coffins’ designers were really helpful in showing us the designs in progress and were happy for us to make little changes as we went along,” continued Craig. “The attention to detail was excellent, they even tied the thistles with a Dewar family tartan ribbon, which made it very special indeed.